Now, if you’d like your boss, a colleague or your client to take a look at the results of your online campaign in its entirety, instead of creating several reports for each project, you can now simply share your campaign by typing in recipients’ email addresses. Sharing is caring. 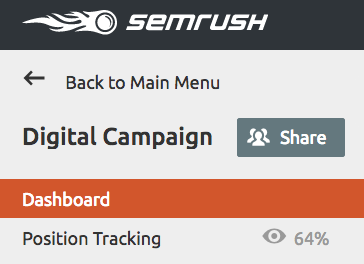 Now you can grant read-only access to your SEMrush projects with a single click in order to get collaborative ideas, present your results and receive feedback anytime. Please note: while in beta, this feature is currently available with a technical limit of up to a 100 shares per account for paid/trial users only. We will consider altering this technical limit based on the type of feedback we get from our users while we're testing this feature. The sharing feature is available through the Main Projects listing interface. Or via the left-side menu when you select a specific project. Your potential collaborators will receive an email invitation saying you are giving them read-only access to one of your projects. When they click on the given link, they will be taken directly to the project. However, in order to view a project’s details, a user has to either log in to SEMrush, or register if they don’t have an account yet. 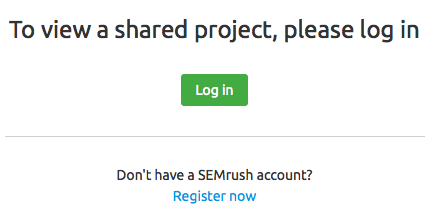 Registration won’t take much time, but only after the user has created a SEMrush account will they be able to see the shared project. We hope this update improves your overall experience with projects and helps you achieve your goals faster.